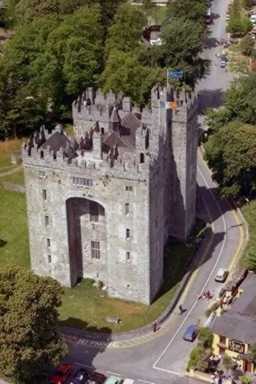 Bunratty is an ideal location for exploring nearby historic sites and attractions. It has traditional Irish music and other examples of traditional Irish culture, like our renowned thatched roofs. We know you’ll enjoy your stay. We can make all your site-seeing arrangements at Ashgrove House. Regarded as being the most complete and authentic medieval castle in Ireland, Bunratty Castle was originally built in 1425 and authentically restored in 1954 to its former medieval splendour. The Folk Park recreates 19th Century Ireland. From the cliffs, you can see the Aran Islands, Galway Bay, the Twelve Pins and Maum Turk Mountains to the north and Loop Head to the South. Built by the Hynes Clan in 1520. The Castle of King John in Limerick was constructed around 1200 on the Shannon River. Constructed by Sean MacNamara, son of Sioda, in 1467. Boireann is the Irish for ‘rocky coast’, and it consists of polished limestone stretching in every direction. The Burren also contains at least 65 megalithic tombs which were erected by its first settlers. Founded in 1982; now recognized nationally and internationally as the leading Centre of it’s kind in the Country. Offers a professional service to persons wishing to trace their Clare ancestry. The Museum tells the story of the 19th Century Ireland, a fascinating window on the past – simply but effectively presented. The themes covered include: famine and emigration, landlords and tenants, music and culture, traditional ways of life. Open all year round. Its ‘Riches of Clare’ exhibition contains the personal collection of the historical past president of Ireland, Eamonn de Valera.